In the more than two decades since Japanese players returned to the MLB, the league has learned how to accommodate the fanfare that comes with them. 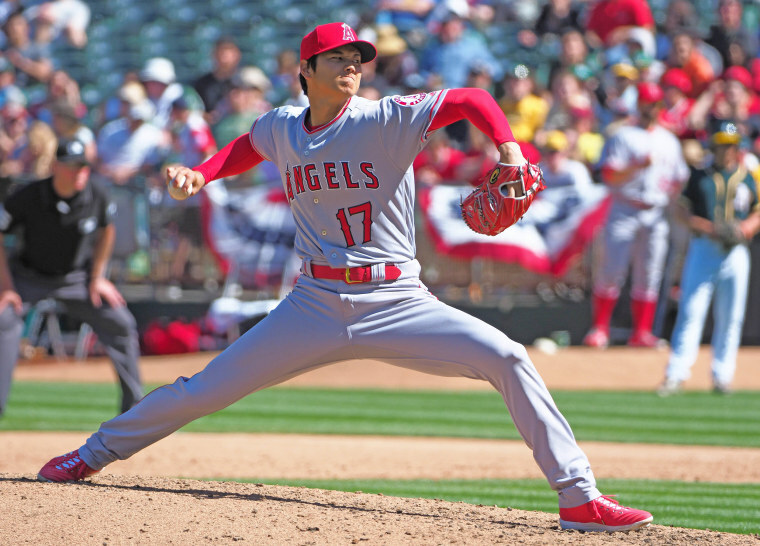 LOS ANGELES — Shohei Ohtani, dubbed the “Japanese Babe Ruth" because of his rare combination of pitching and hitting prowess, won his first game as an MLB pitcher last Sunday then smacked home runs in consecutive contests on Tuesday and Wednesday. The 23-year-old Los Angeles Angel became the first player since Babe Ruth in 1921 to win a game as a starting pitcher and then hit a first-inning home run in a two-day span, according to the MLB, citing to the Elias Sports Bureau, the league's official statistician. There's somebody who's taken that path as a pitcher in Hideo, somebody who's taken that path as a hitter in Ichiro. Shohei's doing both. But the path for Ohtani wasn't paved by the Babe — it was cleared by a Tornado. When Hideo Nomo first took the mound for the Los Angeles Dodgers in May 1995, baffling hitters and thrilling fans with his "Tornado" pitching wind-up, he became the first Japanese player to compete in Major League Baseball in 30 years. Since 1965, when pitcher Masanori Murakami left the San Francisco Giants, both Major League Baseball and Japan's Nippon Professional Baseball (NPB) league had respected each other's player contracts fully. No Japanese players came over; a handful of American free agents played in Japan. Angels pitcher Clyde Wright, who pitched in Japan from 1976 to 78, was teammates with Japanese Baseball Hall of Famers Sadaharu Oh and Isao Harimoto. "It never came up, them wanting to come to the States," Wright said. "They didn't want to leave their hometowns." Nomo, however, longed to test his stuff against the best ballplayers in the world. "It was Nomo's dream to play in the big leagues," Don Nomura told writers Larry Burke and Pete Fornatale in “Change Up: An Oral History of 8 Key Events That Shaped Modern Baseball.” "To be with the best." Nomura, acting as Nomo's agent, took advantage of a loophole in the MLB/NPB agreement to import the 26-year-old pitcher to Los Angeles. "We were all very anxious about how Hideo would do," Koji Bonkobara, a journalist who has covered baseball in America for Japanese outlets since 1981, said. Nomo's whirlwind success — he started the 1995 All-Star Game and won National League Rookie of the Year — ignited "Nomo-mania" in Los Angeles that summer, proving once and for all that Japanese ballplayers belonged on the world's biggest stage. "He definitely established a road for Japanese players to come over here," current Dodgers pitcher Kenta Maeda said through his translator Will Ireton. "In that way, he had a tremendous impact for all of us, including myself." But while Nomo was creating a new reality for Japanese ballplayers on the field, the Dodgers were dealing with a new reality off it. "When you're trying to do something that hasn't been done before, there's a lot of interest," Grace McNamee, the Dodgers' Japanese media liaison from 1995 to 98, recalled. "The whole nation is focused on you." "When a Japanese star comes over here, 50 or 60 writers and photographers come with you," Wright added, laughing. "For the media that was covering Hideo, everything was a first. It was a first for the publicity department to accommodate that number of foreign media covering one player too. There was a huge learning curve for both of us," acknowledged McNamee, who's taken the same position with the Angels to handle the voracious demands on Ohtani. The Oakland A's issued 240 media credentials to Japanese media alone for Ohtani's pitching debut last Sunday in Oakland, according to a MLB.com report. McNamee recalled, regarding the learning curve with Nomo, "We'd hold mini-press conferences for Hideo. It's like what we do with Ohtani. We'd take him into a room, so he'd have an opportunity to talk to all of the media. Because there was no way we could have that many people in the clubhouse surrounding him. " In McNamee's estimation, Japanese media numbers for Nomo were similar to those for Ohtani now. He definitely established a road for Japanese players to come over here. Since Nomo though, Major League Baseball clubs have handled many Japanese superstars, chiefly the Seattle Mariners with right fielder Ichiro Suzuki and the New York Yankees with left fielder Hideki Matsui. For the fans too, the sight of a Japanese star in the MLB isn't as out of the ordinary as it used to be. "Once you've seen something happen once or twice, it's not as eye-opening," Mead said. "The public doesn't read that much into it anymore. There isn't that wonderment to it." But that wonderment has returned with Ohtani, McNamee said. Not because he's Japanese, but because he's trying to become the first great two-way player in the majors since the legendary Ruth. McNamee noted, "There's somebody who's taken that path as a pitcher in Hideo, somebody who's taken that path as a hitter in Ichiro. Shohei's doing both."